As we move into Thanksgiving and Christmas, I've begun gathering ideas and recipes for holiday baking. So as I work my way through the never-ending pile of recipes I've amassed, I'll share the clear winners with you. Sound good? These bars? Already clear winners. Cranberries are one of my favorite winter fruits, and I can't ever resist a dessert that features these beauties. The cranberries are paired with a buttery, chewy, spiced cookie crust, and the combination is truly outstanding. 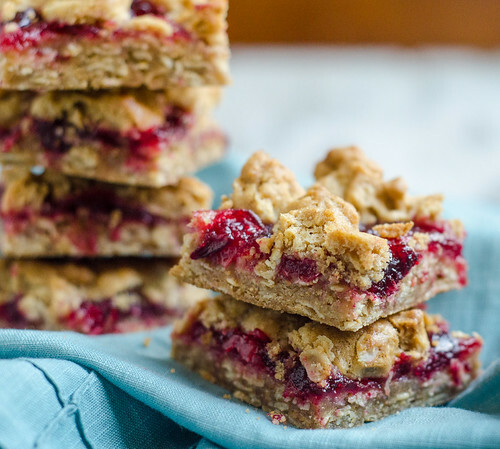 I loved the extra texture that the oats gave the crust, and the addition of brown sugar and cinnamon gave it a nice sweet warmth that perfectly complemented the sweet-tart cranberries. I caught myself sneaking bite after bite all afternoon, cutting off a tiny corner, then going back for more. Caroline ate one as an after school treat, and immediately asked if I would make them for Thanksgiving. Indeed, I think I just might. And hey - these have fruit, eggs, and oats in them… that automatically qualifies them as a healthy breakfast food, right? I think so. In a medium saucepan, bring the cranberries, water, and sugar to a boil over medium heat. Cook, stirring often, for 2 to 3 minutes, or until the cranberries have burst and the juice is starting to thicken. Remove from heat and allow to cool for at least 30 minutes. Adjust the oven rack to the lower-middle position and and heat the oven to 325 degrees. Line a 9x13 inch baking dish with foil, allowing it to hang over on 2 sides (to form a sling). Lightly grease with cooking spray or butter. In a medium bowl, whisk together the oats, flour, cinnamon, and salt. Set aside. In the bowl of a stand mixer fitted with the paddle attachment, beat the butter and brown sugar on medium-high speed until light and fluffy, about 3 minutes. Add the egg and mix until combined. Reduce the speed to low and gradually add the flour/oat mixture, mixing until it is just combined. Transfer 2/3 of the dough to the prepared pan, and press into an even layer. The dough is pretty sticky, so use a piece of plastic wrap to help you. Spread the cranberry mixture in an even layer over the dough, then drop walnut-sized pieces of the remaining dough over the cranberries. Bake 40 to 45 minutes, or until the top is golden-brown, rotating the pan halfway through. Remove from oven and cool on a cooling rack for at least 2 hours. Use the foil overhangs to lift the bars out of the pan and cut into 24 equal pieces. Serve. 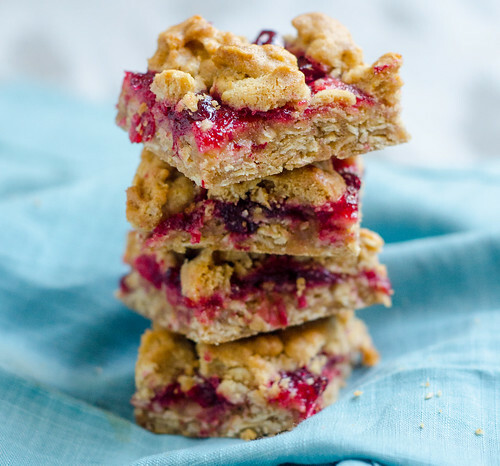 These cranberry oat bars look so delicious and festive! Pinned! Okay that's it...I am totally going to throw a party that will include all of these things! Love that it's both fall AND Mexican-themed. 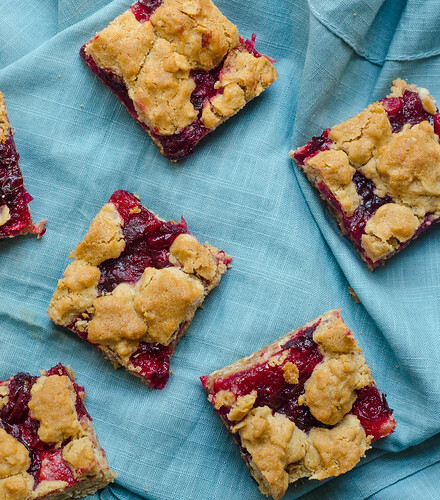 There definitely aren't enough cranberry desserts in this holiday season! They are one of my favorite parts of winter. Must start hoarding now so I can make these over the next few weeks! Yes, please! I love oats pared with a good fall fruit - love these, Josie! Awesome but a lot of butter. (Not that butter isn't amazing!) Have you tried this recipe with lower fat alternatives such as 1 stick of butter and ~1/2 c applesauce? Hi Lucy, I have not, but if you do try let me know how it works! I was actually just telling a friend the other day that I'd like to try lightening these up a bit to make them a legit breakfast bar. Great idea with the applesauce! Thanks, my dear! Can I just say how much I've been drooling over everything you've posted this month?? You're hitting it out of the park these days! Wow. What a gorgeous, decadent Thanksgiving-ish recipe! I love the use of cranberries here, and I can envision these as a wonderful breakfast... or dessert! I'm making these right now and the batter is AMAZING. Gotta get these in the oven fast so I stop sneaking bits. Just wondering, did you mean to write food processor for where to mix up the batter? I used the food processor and it's worked pretty well, but I feel like they would've also been fine with a hand mixer/bowl. Ha, I'm going to laugh at myself for being so literal if that's not what you meant to write. :) Happy Thanksgiving! !